Hjelmco unleaded AVGAS 91/96 UL is made to and meeting the requirements in the US standard for aviation gasoline ASTM D910, grade 91/98. 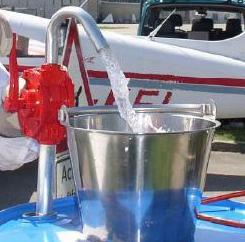 As lead is mandatory in the standard D910, unleaded AVGAS 91/96 UL is not free of lead. The amount of lead is however so trifling it fits into the definition of being unleaded i.e. < 0,002 g/liter. The Kingdom of Sweden mandates unleaded fuels to be transparent, i.e. have no colour. Thus Hjelmco unleaded AVGAS 91/96 UL for use in Sweden is not brown as mandated by ASTM D910. When you look at our unleaded it is like looking into cystal clear spring water.